Dr. Curie was a brilliant physicist who won two Nobel Prizes, one in physics and one in chemistry. With her husband, Pierre, she discovered two elements, radium and polonium, yet she was not satisfied. Knowing that it wasn’t easy, she was always looking ahead to the next scientific challenge. This quote is an excellent reminder to me about how hard it is to see how far you’ve come in the middle of a journey. An education is no different: It’s about the journey, not the destination. The feature pieces in this issue touch on different facets of this concept: grit, mental maintenance, and resilience. 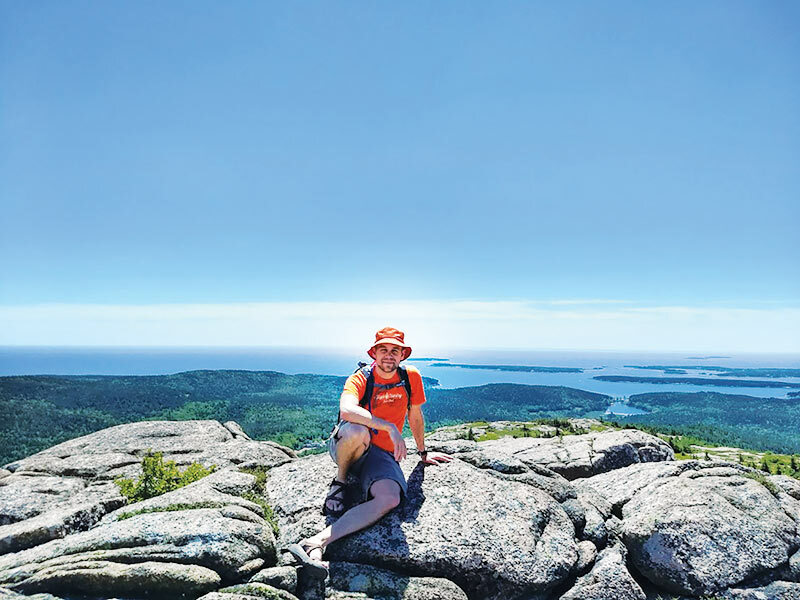 Director of SPS and Sigma Pi Sigma Brad R. Conrad hiking in Acadia National Park. Photos by Brad R. Conrad. Few of us correctly predict our educational journeys at the beginning, even if it seems at the moment like everyone else has it all figured out. We are all people, with the associated limitations and required maintenance. We will stumble, fall, and sometimes make poor decisions. Sometimes we won’t know what the next step should be. But it’s through these experiences that we grow and advance, and an education is no different. We are not defined by a single course or homework set, but we are shaped by these experiences, stumbles and all. A sense of perspective on our educational journey is a very hard thing to achieve. We embark on our studies with not only a set of expectations placed on us, but also those we set on ourselves. It’s so easy to focus on the tasks we have not yet completed that we can forget to celebrate what we’ve accomplished. Sometimes we assign more value to other people’s expectations than we do to our own. Yet, the only person one ultimately needs to answer to is oneself. One of the hardest lessons for me to learn as an undergraduate was that I need to control the shape of my education, and if I’m not taking care of myself, it’s hard for me to take care of anything else, including my academic progress. Resilience, perseverance, and grit are vital to making it through the difficult times (and there are difficult times), but knowing when to rest and reset is just as important as knowing when to keep at it. And just as every journey requires both perseverance and rest, so too does an education. The goal is to not rush through as many things as possible but to appreciate the stops along the way. If, on vacation, you raced from city to city without ever appreciating the local culture or taking time to rest, you’ve cheated yourself and are not really accomplishing the goal anymore. And unlike a vacation, you may not end up back where you started; it’s okay if your goals change mid- experience. The purpose of an education is to challenge and change you, so pause from time to time to evaluate the shape and path of your education. You may not even recognize yourself at the end of it.